An important LA County diversion program, the Second Chance Women’s Reentry Court (WRC), is slated to be defunded in December 2015, after receiving a six-month extension in June. The Los Angeles County Department of Public Health has conducted an assessment on whether to keep the program funded past its scheduled end-date in December. The program, which has helped more than 300 women since its inception, is a multi-agency effort between the District Attorney’s Office, Public Defender’s Office, Department of Probation, LA County Superior Court, California Department of Corrections & Rehabilitation, County Criminal Justice Coordination Committee, and the Department of Public Health’s Substance Abuse and Prevention Control Program. By participating in the WRC, women charged with non-serious felonies or probation violations take part in at least a six-month residential program and then up to a year of outpatient care instead of serving a jail sentence. 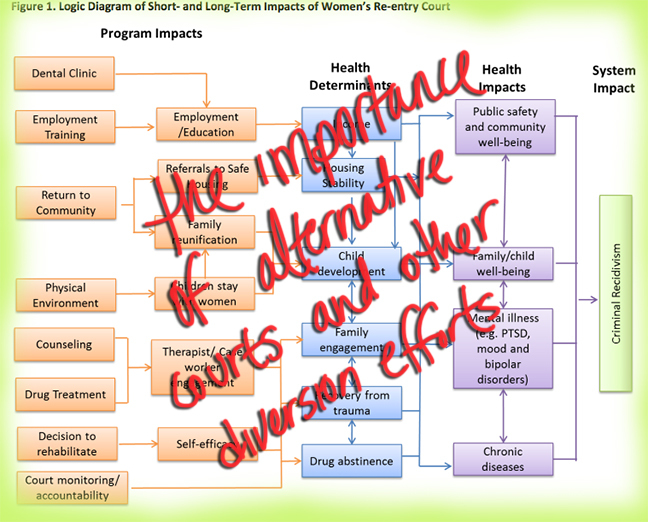 The alternative court program relies on evidence-based, trauma-informed, and gender-specific strategies to treat women’s underlying issues, rather than punish alleged offenses. Women in the program receive mental health services and substance abuse treatment, as well as help with housing and employment and family reunification services, when needed. In the three years after graduating from the program in 2011-2012, 18% of WRC participants had come back into contact with the criminal justice system, compared with a recidivism rate of nearly 50% for women released from CA prisons in 2008-2009. The rate of homelessness was cut in half for women coming out of the court program than when they were admitted. Women also built better relationships with their families and kids, and had significantly higher rates of employment and school enrollment. The assessment also found that women who received the gender-specific treatment were one-fifth as likely to exhibit signs of PTSD a year after the end of the program, as compared with women who did not receive gender-specific help. Besides extending the program, the Public Health Department also recommends boosting the number of programs like WRC that serve women with co-occurring substance abuse and mental health issues. The assessment also calls for increased staff numbers to provide more help for women transitioning between residential and outpatient treatment through WRC, and for those graduating from the WRC. Be sure to check our updated version of last night’s story.